Cash is everything when it comes to business, or anything in our society for that matter. Small businesses and corporations have the same purpose—to generate enough cash from business activities so it can meet expenses, repay investors, and achieve growth. The cash flow is a reflection of the health of the business and reveals every detail of the company, big and small. 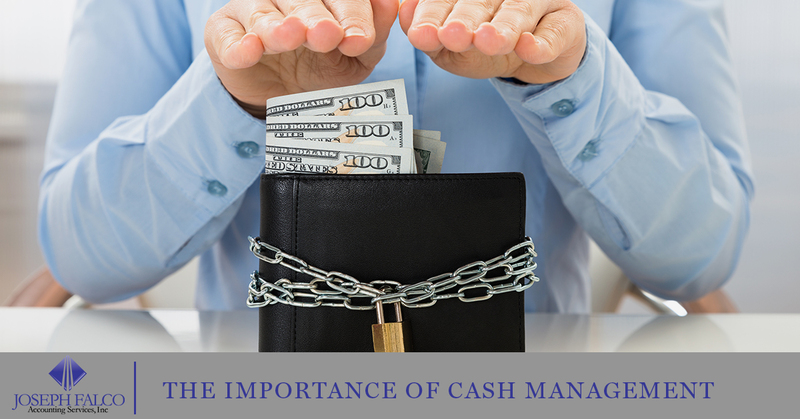 The lifeline of business is cash, and without proper cash management by an accounting firm like Joseph Falco, businesses risk never achieving their full potential. Whether you are an individual seeking assistance for your cash management or you’re a small business looking for ways to improve your company’s growth, Joseph Falco Accounting Services can lead you to success. Continue reading to learn why our cash management solutions are important for your small business, and contact our offices today to schedule a consultation. As mentioned above, cash is the motivating factor to keep businesses operating. A basic business rule of thumb is, you must spend cash to earn it. Businesses need to be able to successfully generate cash coming in to meet the business needs and avoid taking on debt. However, there are situations in which businesses are obligated to take on debt to meet expenses, and new challenges are presented. The debtors are introduced into the equation and are likely to have a say in the business’ plan for cash management and impact financial decisions. When a business is unable to generate adequate cash to meet the needs of the company, it’s difficult to conduct routine activities. Actions such as paying suppliers, purchasing materials, paying employees are essential and must be met on a regular basis. If this is beginning to look like a challenge, or you’d prefer to rely on a trusting accountant, contact Joseph Falco Accounting Services. When a company is successfully making a profit, making more revenue than it incurs in expenses, managing cash flow correctly is incredibly important to the business success. Areas that offer possibilities for better cash management are accounts receivable, accounts payable, and inventories. The accountants at Joseph Falco will assess the businesses cash flow and develop a financial plan that is appropriate to help your business grow. There is a right balance between having too much cash on hand and having an adequate supply of cash. If a business has too much cash, they’re missing out on opportunities to invest the cash and generate earnings. And when there isn’t enough cash, business owners resort to borrowing money or sell off liquid investments to generate the cash it needs. If the return on investments is expected to generate higher earnings than it pays in its borrowings, the business could decide to invest its surplus cash and then borrow additional cash in order to meet the business needs. How will you determine the right balance for your business? The answer is to hire a cash flow manager for the best cash management techniques for your business. Keep your business afloat and start growing your business the right away by hiring Joseph Falco Accounting Services in Brooklyn to manage your small business cash flow. We also provide personal money management to help individuals safe for retirement, college, investments, and more. Contact our accounting firm today and schedule a consultation.